Tension headache refers to head pain associated with stress and muscle contraction. These headaches may occur only occasionally in response to a stressful event. They may also be chronic, occurring frequently. Some tension headaches are nearly constant, with daily pain that may vary in intensity. 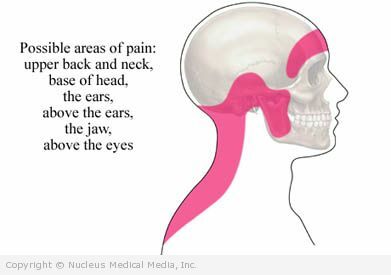 Tension headache symptoms usually start slowly and build. Headaches can become so severe and constant that they interfere with normal activities and sleep. The doctor will ask about your symptoms and medical history, and perform a physical exam. The cause of a headache can be difficult to determine. Tension headaches are managed, rather than cured. Therapies aim to stop the headache and reduce the frequency of future episodes. Over-the-counter pain pills — Continuous use of some over-the-counter medication may create rebound pain when you stop taking the drug. Using these medicines too much can cause headaches. Pain medications are most effective when taken at the first sign of pain and before it becomes severe. Put an ice pack or heat pack on your head or neck to ease discomfort. Take a warm shower, with water running over tense muscles. Massage your temples and neck. Identify events that trigger the headaches and work toward resolution. Acupuncture — Acupuncture may help you to have more headache-free days and lessen the intensity of headaches when they do occur. Physical therapy — Physical therapists can help you develop a home-exercise program. If you are diagnosed with a tension headache, follow your doctor’s instructions. Keep a diary, marking when headaches occur and what you were doing before they started. Learn to recognize what provokes a tension headache. Avoid or minimize stressful situations. Take frequent breaks to walk or move around. Make time for pleasurable activities. Practice relaxation techniques, such as deep breathing and focusing on something pleasant. Learn techniques for coping with difficult or stressful situations. Make time for friends and build a strong support system. Hold the phone, rather than cradling it on your shoulder, or use a headset.